It’s October! Fall is here, the kids are back to school and the work week seems longer since summer is over. Don’t despair. 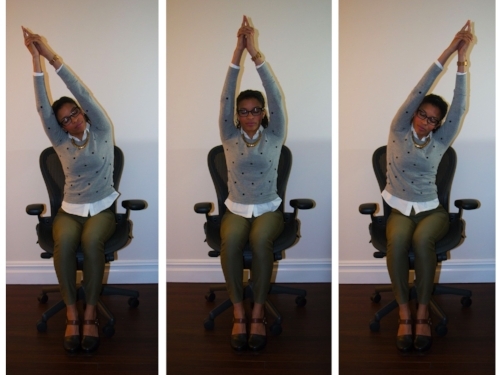 Below are three yoga poses that you can do at your desk to help relieve tension, stress and anxiety while you’re at work, on your lunch break, or waiting in your car to pick up the kids. Place your feet hip distance apart and flat on the floor. Sit up straight in your chair. Extend your hands straight over head (if this is uncomfortable, lower your arms to a comfortable level), clasp your hands together. Take 3 deep breaths here. Lean you arms over to the right as you extend the left side of your torso (torso feels like it is being pushed to the left, as arms are moving to the right). Envision the left side of your torso getting longer as you stretch your torso and your arms. Stay here for five breaths. Move back to midline and take three breaths here before leaning your arms to the left and extending the right side of your torso. Stay here for 5 breaths. Take your right ankle and place it on your left knee. Your bent right leg and your left thigh will look like a triangle. Gently grab your right shin and lean your torso forward. You should feel a stretch in your right inner thigh, right groin and your lower back. Slowly breathe into your groin and your back body for five breaths. You can challenge yourself by placing your torso closer to your thighs. Please do not over do it. Nothing should hurt while you are in this pose. After five breaths switch sides. Place both feet firmly on the floor about hip distance apart. Starting with cow pose, push your chest forward as you spread your collarbones and your shoulders. You should feel your should blades attempting to touch each other. Make sure your shoulders are rolled back and away from your ear. On your next exhale, gently round your back and drop your chin towards your chest. This is cat pose. Continue the oscillation between cat and cow, staying in sync with your breath for five rounds. You should be feeling nice and relaxed right now and ready to finish the rest of your day at work. You can also do these three poses before going to sleep to help relax before bed.